Springs play a crucial role in the operation of your garage door. However, over time they can suffer from the wear and tear that comes from raising and lowering a heavy load hundreds, if not over a thousand times a year. Broken or damaged springs can make it impossible for you to open your door, and the act of replacing them can be extremely dangerous when handled by amateurs. Regular checks and maintenance carried out by our trained professionals can ensure these components will continue to operate correctly and safely for many years to come. 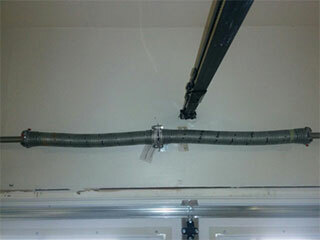 The repeated act of opening and closing your garage door every single day will gradually cause the springs to weaken. Eventually they will break completely. Torsion springs can be lubricated to increase their efficiency and reduce the strain they operate under. Some regular adjustment can also be beneficial, however this type of task is best left to the experts. As a spring breaks, it can cause your garage door to come crashing down, which – needless to say – would be extremely dangerous. The most common risk, however, comes when you decide to repair or replace these components by yourself. A broken garage door spring represents a real danger and needs to be handled with precision and care. Rather than attempting the task by yourself, we strongly recommended that you have our technicians help you out instead. We have the skills and the experience required to do so safely. As your local specialists for all things garage doors, our team has a wealth of knowledge to draw from in order to properly maintain or replace your torsion or extension springs. Get in touch with our experts at Garage Door Repair Palmetto Bay as soon as you find yourself in need of assistance.